In a research project at the Royal Institute of Technology we have developeda pump based on a new fluid pump principle with no valves. 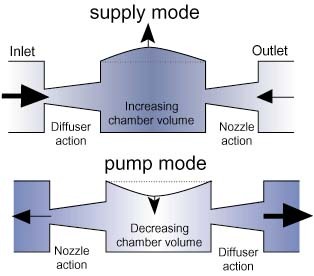 The pump consists oftwo fluid flow rectifying diffuser/nozzle elements which are connected to theinlet and outlet of a pump chamber with an oscillating pump diaphragm, as shownin Fig.1. The diffuser/nozzle element has a lower flow resistance in thediffuser direction (indicated by the larger arrow), i.e. in the direction ofincreasing cross-sectional area, than in the opposite nozzle direction(indicated by the smaller arrow). This means that the diaphragm oscillationresults in a new flow in the diffuser direction. Both conical and flat-walleddiffuser/nozzle elements can be used. Fig. 1. The principal operation of avalveless single-diaphragm pump during the supply and pump modes. A pump with two pump elements in parallel is shown in Fig.2. The pumpcavities and diffusers are milled in two 0.5mm thick brass plates which areglued together. 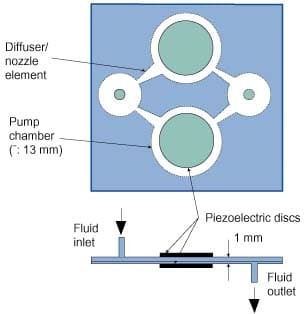 The four diaphragms (two per pump) are driven by piezoelectricdiscs. The pump has a maximum volume flow of 16 ml/min and a maximum pumppressure of 1.7m H2O. The pump was operated at the pump resonancefrequency of 540Hz, which results in a maximum diffuser throat velocity of 16m/s. We have also fabricated an electromagnetically driven larger pump with apump flow capacity of 1.8 litres/min and a smaller pump based on siliconmicromachining. Recently we have developed a gas pump based on the samevalveless pump principle. Fig. 2. A top and side view of the designof a valveless two-chamber pump with four diaphragms. The pump arrangement with no moving parts has several advantages, includingvery high reliability and long lifetime. Furthermore, the simple structurefacilitates small size and low fabrication costs. Since we believe that thesecharacteristics make the pump ideal for use in reliable and compact liquidcooling systems of electronics, we are currently developing a small sized pumpprototype with target specifications of 120 ml/min at 0.1m H2O. 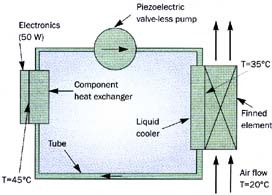 Thepump is intended to be used in a cooling application described in Fig.3, wherethe coolant is water. Fig. 3. The new valveless pump in a coolingsystem for electronics.